Want hair like Donald Trump? Then use Head & Shoulders! In the oft bewildering world of PR it’s sometimes difficult for me to come to terms with what constitutes a good story. But then, as the famous saying goes, any press is good press. Popping into my inbox this morning, for example, is the news that Donald Trump, uber-wealthy businessman, Presidential drop-out and po-faced Obama nemesis uses Head & Shoulders to keep his legendary locks looking so luscious. He has revealed, apparently, that his simple grooming regime includes ‘washing his hair everyday with Head & Shoulders, leaving it to dry for 60 minutes before combing it ‘a little bit forward and back’’ (sorry L’Oreal, no mention of an industrial can of Elnett). It’s a fun story and offers some superbly practical advice for anyone wanting to emulate a timeless comb-over. But really, is it the kind of brand association you’d be proud of? I mean, this is a man whose hair is only faintly less ridiculous than Phil Spector’s – and Phil’s was a wig. The fact that the little press ditty then goes on to mention Trump in the same sentence as Head & Shoulders ambassador Jenson Button tops things off for me. I mean, James Corden and David Beckham might share a fondness for the same skimpy briefs but they’re sure as hell not going to look equally as good in them are they? Know what I mean? Any decent stylist could do a better job than he must do himself, so Donald must want his hair that way. 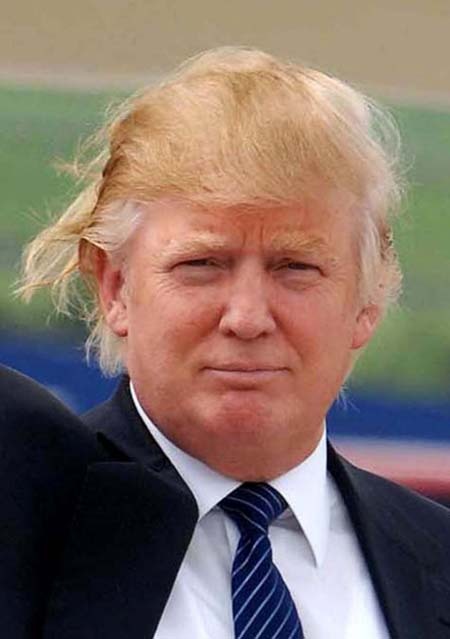 I watch The Apprentice USA and he jokes about the hair quite a lot, so he is aware of what other people think – I respect the way he refuses to change despite the ridicule. I bet very few people would dare tell him to his face what they think. I wish his daughter Ivanka would say something – and soon – her two brothers seem to be adopting the Trump style too.